I have been a concrete finisher for 12 years, as well as a student of Economics, I will soon be Graduating from Oakland University. I am also a father of two wonderful children. As you can imagine life is extremely busy. However, I always find the time to do the things I enjoy. I typically cover Oakland/Livingston counties and pretty much anything South of there. I am also available to track in the Northeast Lower when I am at my Cabin in Mikado. With my schedule during the week I am generally only available to track in the evenings. I also track day or night on the weekends. You can feel free to call and ask questions or check availability, leave a message or shoot me a text if I do not pick, I make every effort to return every call, and I take as many tracks as I possibly can, or I will get you in touch with one of our other trackers. 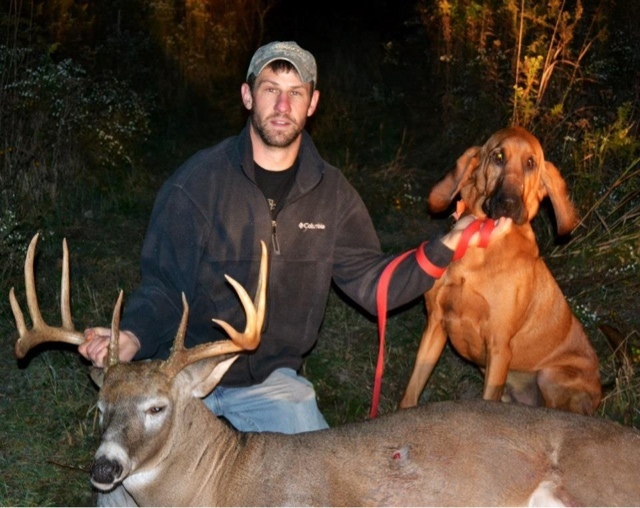 I have been a hunter for 20 years and I have had my share of success and disappointments. Whitetail deer quickly became my passion and I have dedicated countless hours researching hunting techniques and studying Whitetails. I am not an expert by any means, but I am certainly well educated in both hunting and tracking. I believe what separates a good tracker from a great tracker (whether by eye, or with dog) is ones ability to notice and assess small details, ones tracking abilities are certainly increased through experience. 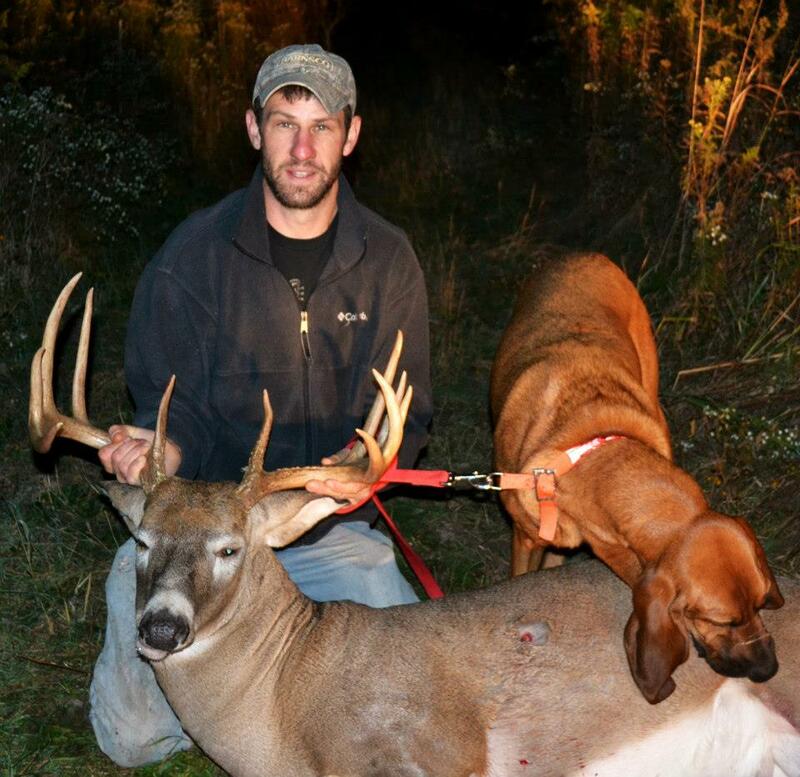 Having the opportunity to track as many whitetails as Michigan Deer Track'n Hounds trackers do each year gives us an extended advantage in our personal abilities, not to mention our true talent, our partners, our hounds! I have 2 dogs, a Bloodhound, and a Catahoula mix. 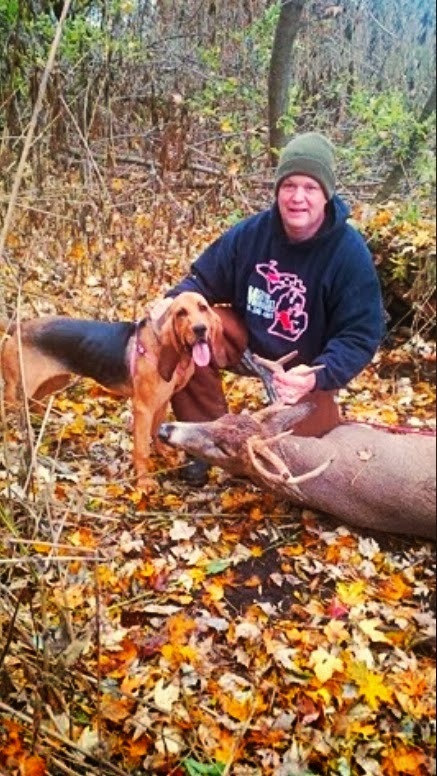 "Cash" my bloodhound has been my partner for the last 3 years. 1 year of training and 2 years of professional tracking. He has a phenomenal nose and I believe he enjoys tracking more than any other activity. He is not an easy dog to handle due to his size, but he sure is exciting to watch work. 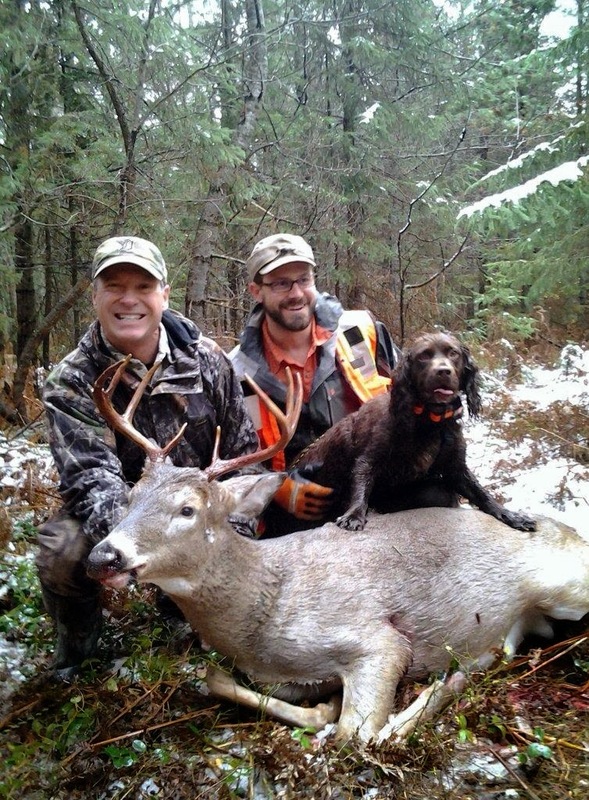 In the past 2 years we have recovered more than 20 deer and 1 Black Bear. We have also had several deer that were not recovered but later seen alive and well. "Dusty" my Catahoula, has an amazing nose and is a great tracker, however he does have some issues with fear and can get a bit "skittish" while tracking around people he does not know. He has not been on any "Live" tracks, but I am certainly excited to try him out this year should the right opportunity present itself. I have been working with Dusty for the past year and look forward to "seeing what he's got". I certainly have had the opportunity to visit some amazing hunting grounds, have seen many parts of the State, and meet some great folks. It has been quite an adventure. Good Luck to all in this quickly approaching hunting season. Labels: cash, Mike Riepen, Oakland county Michigan. Livingston county Michigan.